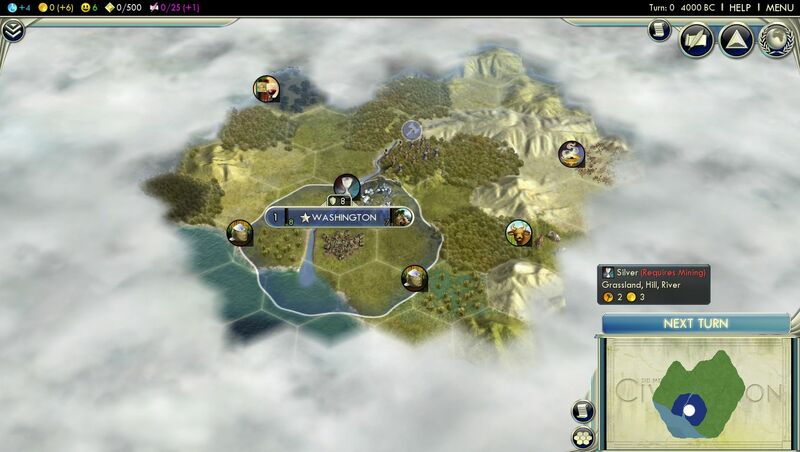 So... Civ5 has been released now. It was certainly a different experience this time around, not working with the development team, and not having an insider's view of the whole process. That means I'm back to being a normal gamer again, and getting the experience that everyone else gets when starting up a new game. 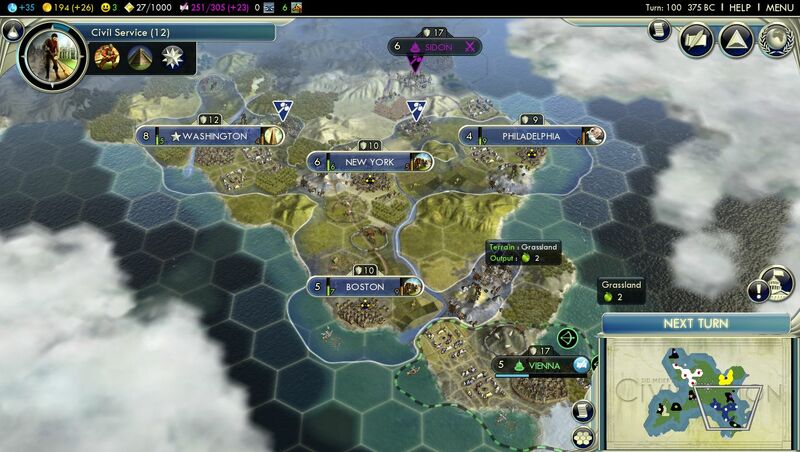 Let's dive right in and see what there is to find in Civilization 5. The ballistas tore through the Persian units like paper. I did not lose a single unit in the fighting, and with captured Persian marble and spices, I had enough happiness to afford to keep the new cities. My Roman Empire was so egregiously far out in front, there was no point in playing any further. This game was completely over. I decided I would learn more from increasing the difficulty level yet again, and starting another game on Emperor. This is the story of that game, the American Empire. There are no leader traits in Civilization 5, which I think is a step backwards, but there you have it. Instead each civ has its own special ability, just like in Civ Revolutions, and there is only one leader per civilization once again. America's civ trait is called Manifest Destiny, which grants +1 sight to all units (decent) and 25% reduced cost when purchasing tiles (above average). These traits are very poorly balanced at the moment, with some of the civ traits almost completely useless, like the poor Ottomans and their "50% chance to capture a barbarian naval unit in combat." Seriously, how useless is that?! Other civ traits are highly dependent on the gifts from city states, making them useless for Multiplayer games - or would be, if MP wasn't completely unplayable right now at release. The poor balance between the traits at the moment reminds me of Master of Orion 2, in which some abilities were so much better than others that they became "must haves" for any MP activity. This area of the game needs a lot more work currently - expect to read that a lot of that here, because this game has some very, very serious balance problems right now! 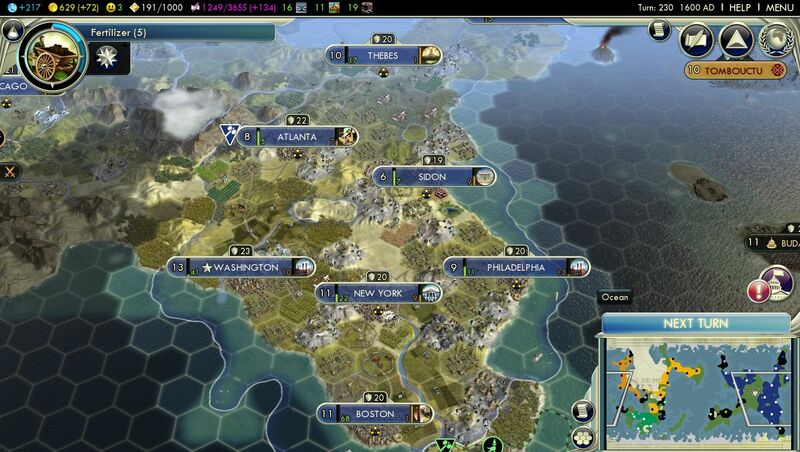 Anyway, I was playing as America in this game, with the starting position you see above. 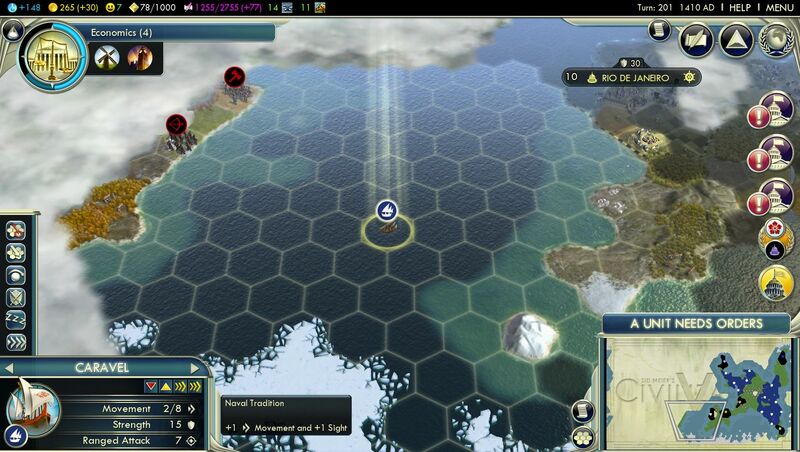 I had a strong starting position here, on a river with silver and two sugar resources nearby. Happiness resources are incredibly important in Civ5, as they are what allows you to grow and expand past the happiness limit. Strategic resources are also important, although the maps tend to be well balanced and it's rare to be stuck without iron or horses or whatever. (Kudos, Sirian!) Food bonus resources, the critical tiles in Civ3/Civ4, are almost useless in this game, providing extremely minor benefits. See those cows? They just turn a grassland tile from 2/0 into a 3/0 tile, no better than a grassland farm. Actually worse than a farm, because once you reach Civil Service tech, which is quite early in the game, a river farm will become a 4/0 tile! Even with a pasture added, the cows only become a 3/1 tile, which is good but not great. The tile yields are much, much lower in Civ5 than in Civ4 - an interesting decision which drastically slows the pace of the early game. I'm... not really a huge fan of this, but that's the way they've gone, and there's nothing we can do about it. I started with a scout build, because huts are extremely powerful and there are other benefits from exploration as well. 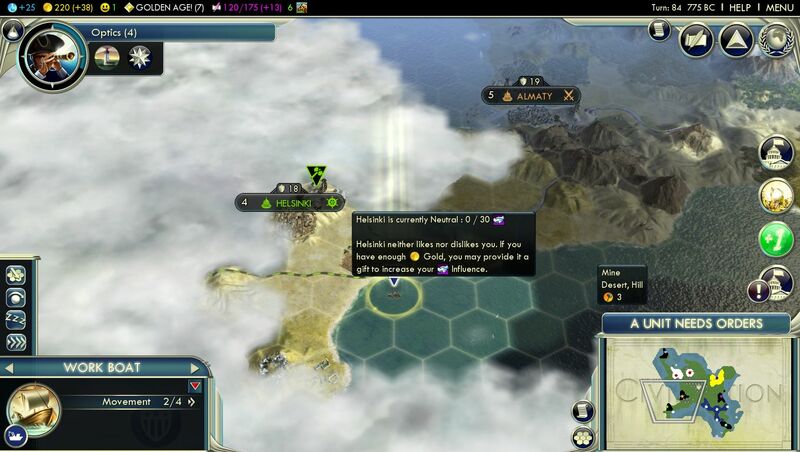 You get free gold just for meeting city states, not to mention happiness bonuses from finding natural wonders. 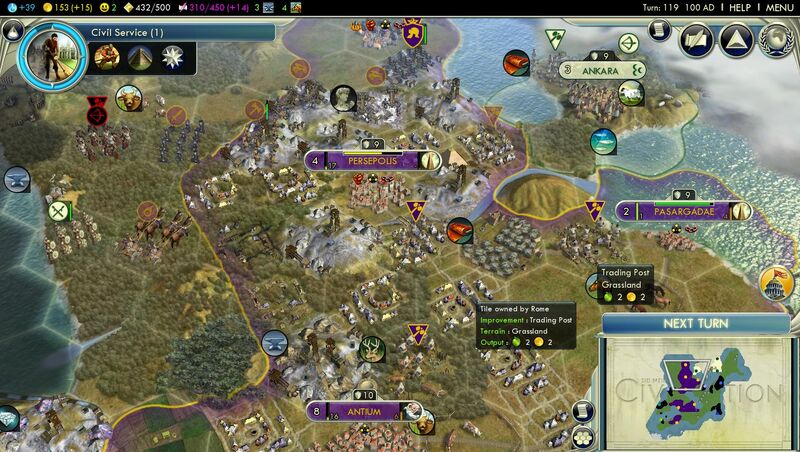 Scouts are especially good for America, with their sight bonus from the civ trait. After the scout, I would train a worker (17 turns to build! That's the new normal though...) and then a second warrior. 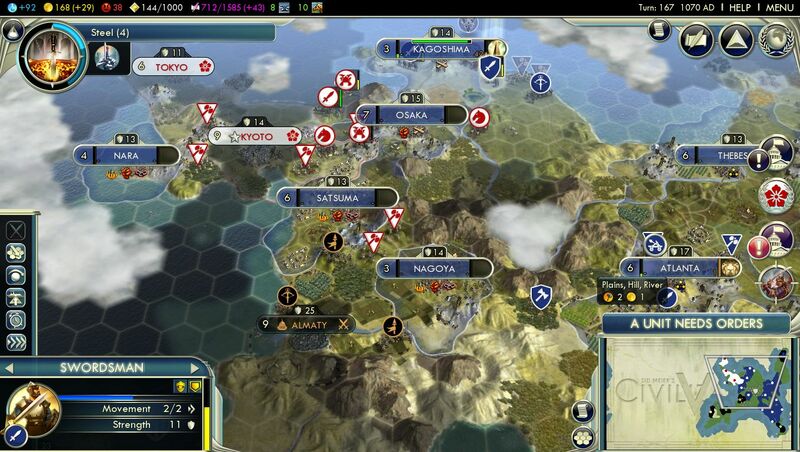 Barbs are plentiful in Civ5, and no joke. You need units to deal with them. My scout soon found a bunch of city states (one Cultured to the south and two Militaristic, one to the north and one to the west) along with Egypt and Japan. They were the only AI neighbors on this landmass, a Continents map script. Sidon is the city state nearest to me. It's a Militaristic city state, which is by far the least desired of the three types, and they are dangling a worker right on their border. I can spend 15 turns slowly training a worker, or I can declare war and steal this one at virtually no penalty. What do you think I should do? So of course I stole their worker, and then signed peace the next turn with Sidon. They went to "Furious" relations, -60 on the influence scale, but of course that will repair by 1 each turn that passes. Eventually they will be back to neutral relations, without me doing a thing. This isn't totally penalty free (the game remembers how aggressively you behave towards city states), but the reward far outweighs the penalty, in my opinion. I spent my early Social Policies in the Liberty tree, which I haven't seen too many other players doing. The initial benefit of 50% bonus production towards settlers does help out a lot in the early game, although it becomes pointless in the midgame, given how rarely settlers are built and how cheap they are. I actually like the Liberty tree for some of the other policies, namely Citizenship's +25% worker speed (a godsend when starting out), Representation's +1 culture in each city (a very big deal in the early game) and Meritocracy's +1 happiness for each city connected to the capital. I like to expand quickly and build lots of cities, so anything that grants benefits on a per-city basis tends to work well for me. Tradition only applies to the capital city, which feels weak to me, and I've had no problem winning militarily without the advantages of the Honor tree. Now, one thing I want to experiment with is saving the policy choices for later eras, such as Piety or Patronage, but I actually didn't know you could do that when I played this game. Still lots of experimentation to be done here. I've been sitting next to this barb camp for the past dozen turns, because I know it's only a matter of time until one of these city states will request a "mission" to go kill the barb encampment, and then I'll receive tons of influence from them for free. Sure enough, Sidon asks me to kill the barbs, and when I do so, we immediately become friends. 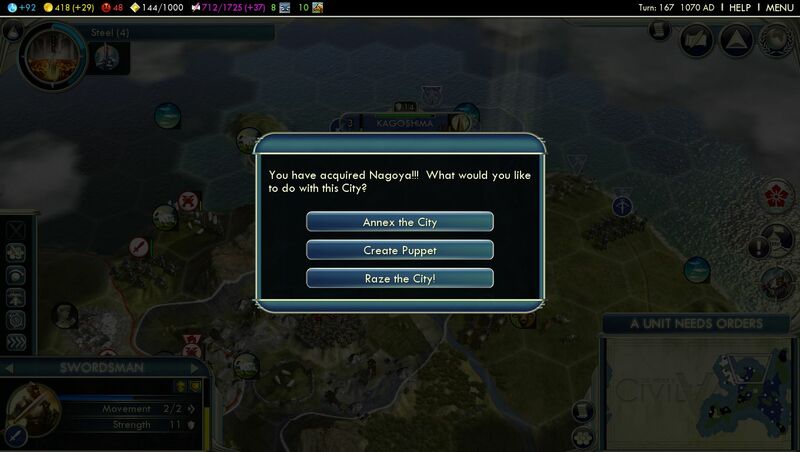 The same city state I brutally whacked for a worker earlier! This demonstrates the general silliness of the city state system, where you can get massive windfall profits from little more than being in the right place at the right time. 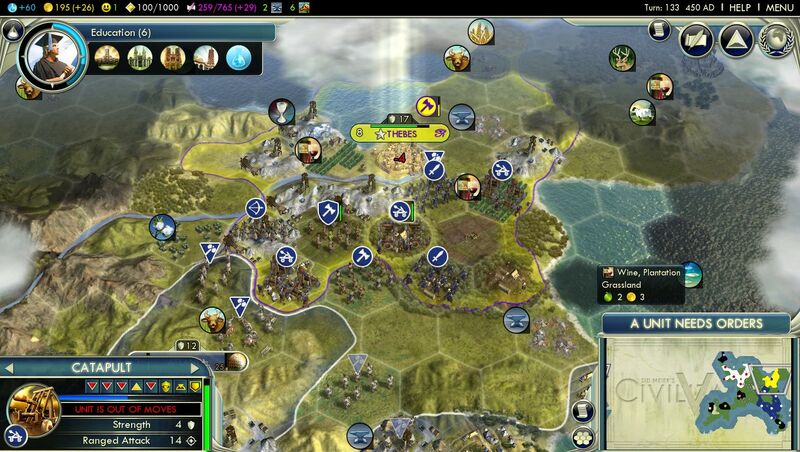 More on the city states later. 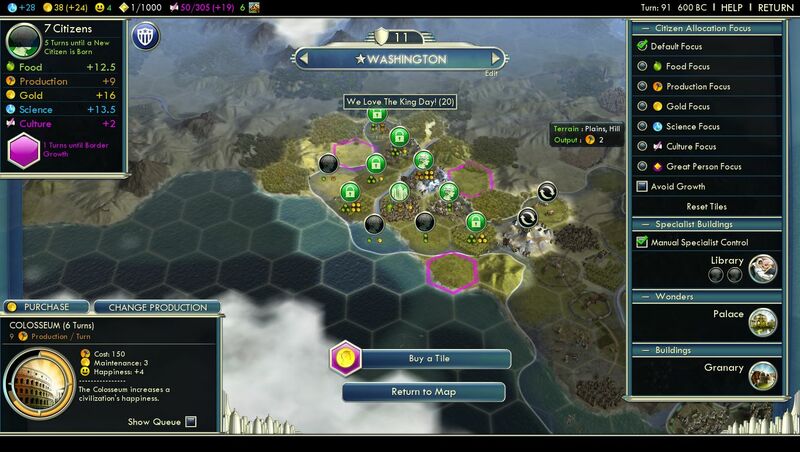 The area to the north and west of Washington didn't have much food, so I concentrated over here with my early expansion. New York was in a fertile river valley, and combined with all those hill tiles, it had excellent production - excellent for this game anyway! Everything takes AGES to build early on in Civ5, curiously making the beginning of the game the slowest and least interesting part. Very strange design there. Boston was founded to claim those whales, but Vienna managed to expand/purchase the tile just a turn or two before I founded the city. Argh. I would end up feeding Vienna thousands of gold over the course of this game so that they would gift me those whales, because that was the only source of the darned things anywhere in the whole world! Boston became a fine city in its own right; I bought the hill tile where you see the Viennese warrior pretty early on, and that turned out to have iron on it. Nice bit of luck there. I added a fourth city right next to the barb encampment in the above picture, Philadelphia, which worked the fish tiles, two hills, and a whole bunch of grassland trading posts. 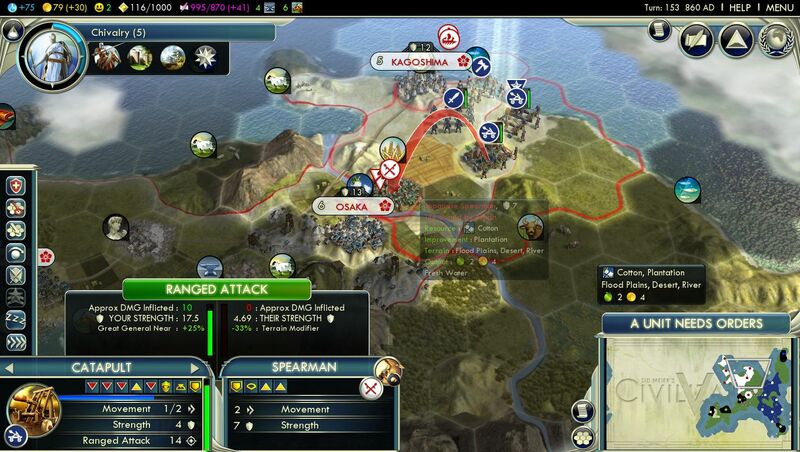 This formed a strong core of cities, which were also almost completely safe from attack by the AI civs. Managing the happiness of four cities so early on, at Emperor difficulty, was a tough juggling act, which I was just able to manage. The economics of this game are really bizarre: adding additional cities will increase your gold and your research, but will cost you happiness. If you look only at gold/research, then adding more cities only makes your empire better! Of course, you need to have the happiness to control them, and you can pretty much forget about a Cultural victory if you keep expanding, because more cities also increase the cost of additional social policies. 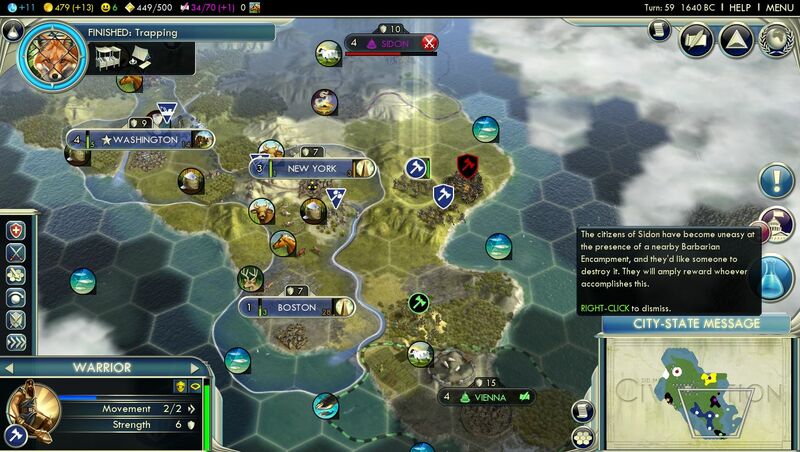 (Note: I think this is a mistake, making it IMPOSSIBLE for large civs to win by culture. 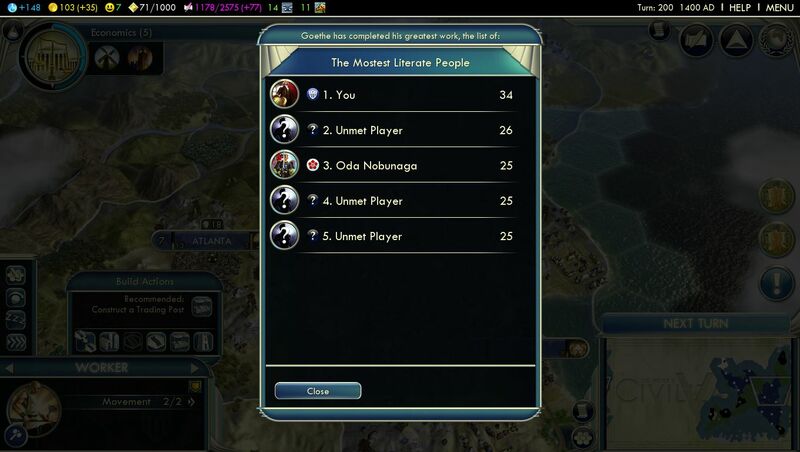 In Civ3/Civ4, you could win by culture if you were small, but you weren't excluded by having a large civ. I think this should have been implemented differently.) As far as I'm concerned, social policies are nice, but I'd still rather have a big empire than a small one. All the policies in the world aren't saving you if I'm triple the size, with more research and more gold and more production! Hello, Helsinki! Hidden behind Almaty and that mountain range, I couldn't find you by land. Maritime city states provide free food when befriended. Yes, free food!!! Friendship status is +2 food in the capital and +1 food everywhere else, Ally status is double that. Oh, and it's *PER* maritime city state, since you can get the bonus more than once. This makes them by far the strongest of the three types, as they allow you to skip farms and focus on mining in your cities. Because production is so ungodly slow in the early areas of this game, the optimal play seems to be befriending Maritime city states, relying on magical maritime food for growth, and laying down lots of mines for production. Hill tiles are now the best in the game, especially riverside hills, which can be farmed for a 2/2/1 tile post-Civil Service. Unfortunately, the game doesn't seem to realize the value of these tiles, and doesn't prioritize them when expanding tiles culturally (which you cannot manually pick, for inexplicable reasons). Civ5 desperately needs to tone down or eliminate the freebies provided by city states, which are extremely out of balance in the early game. It's hard to see, but Washington is getting 6 food/turn from the center city tile. Two of that comes from the granary it built, and two of that from my friendship status with Helsinki. If I had found the Maritime city state earlier, I would not have bothered building the granary. Why spend 100 shields and 1 gold/turn for a paltry +2 food/turn, when you can get +4 food/turn (and an additional +2 food/turn in every other city!) just from allying with a Maritime city state? It's silly how the game intends you to build those granaries and watermills, only to make them virtually pointless with another game element. I'm thinking about just turning off the city states and just playing the game without them, because that would improve the balance (and make things significantly harder!) in the early stages. But then a Diplomatic victory becomes impossible, and then the Patronage tree is useless, and a bunch of the civ traits are pointless. Argh. Firaxis, if you are reading this, you need to do a complete reworking of the benefits of the city states. Right now, the whole early game is about exploiting them for as many magical freebie benefits as possible. I... can't imagine that that's what the designers were going for. I hope it's not! My four cities rank second in Population, but that's because this stat is a geometric one like in Civ4 (where a size 5 city equals something like eighty size 1 cities in Population). Crop Yield tells the better story, where the maritime boost has me far out in front of the AIs. 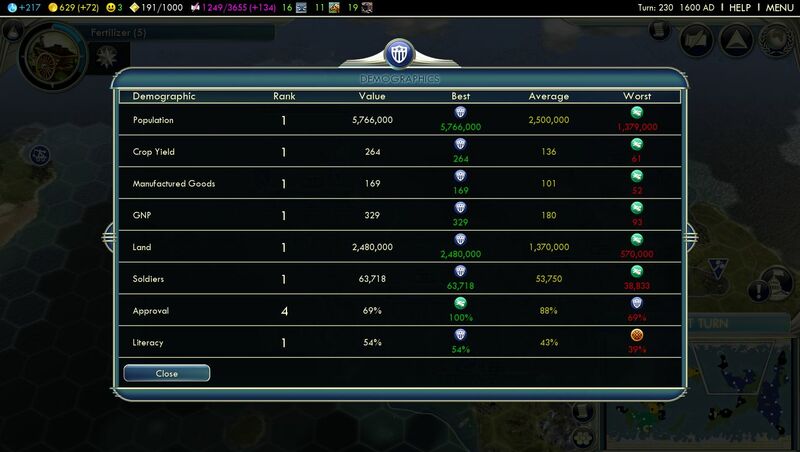 It also allows me to mine and get the Production edge, and of course all my cities have put me tops in Land as well. I still have no idea what the GNP stat means - is this gold, or research, or culture? - but I'm leading in that as well. Low approval rate is actually a good thing, as it means I'm constantly running tight against the happiness cap, which is where I want to be. If you have a lot of happiness, go out and found more cities! (Of course, that means few golden ages for me, but I can still get them from wonders/Great People. And they'll be more valuable if I have more cities for more tiles worked.) Although I'm not dominating like I was in my Prince/King games, I would say that I'm in a comfortable position at or near the top of the pack. The initial sugar and silver resources were the only luxuries in my starting corner, aside from those whales I couldn't secure away from Vienna. I added a fifth city to claim wines in a low-food region to the north, one which had the potential to grab cotton as well eventually with some cultural expansion. The next-closest luxury was the incense located at Sidon. I had no intention of gifting Sidon a million gold over the course of the game for that incense; the city state was Militaristic, meaning it was almost useless, and Sidon was nearly surrounded by my borders. I didn't want to make friends here, I wanted that city incorporated into my empire. Time to start training some units for war! 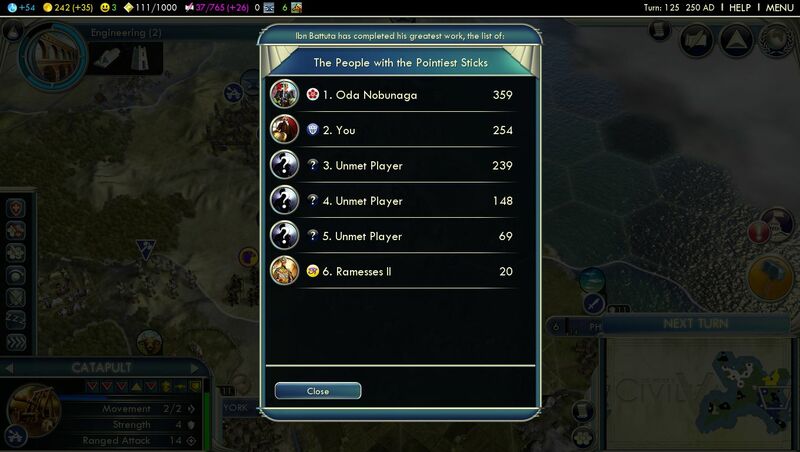 It was good to see that I was ranked near the top, although somewhat concerning how much strength Japan had. (Nobunaga had been throwing that military strength at city states near him, and failing to achieve anything other than wasting units. It's not a good sign that the AI has to be on Immortal or Deity right now to have any military success against city states...) More importantly, look at Ramesses. Military score of 20?! I have TWELVE TIMES his military strength?!? What the hell has this guy been doing? He's got exactly one city, just his capital, and he's done nothing to defend it. Oh yes, I'm sure your wonders and social policies will do very well to save you, Mr. Ramesses. How does this happen on Emperor difficulty?! These ranking lists are useful, and provide nice information when they pop up. However, they only show up on certain dates, and there's no way to access this information while playing normally. Some of that really should be available to players; right now, there's no way to tell whether you are militarily stronger or weaker than the other civs, for example. 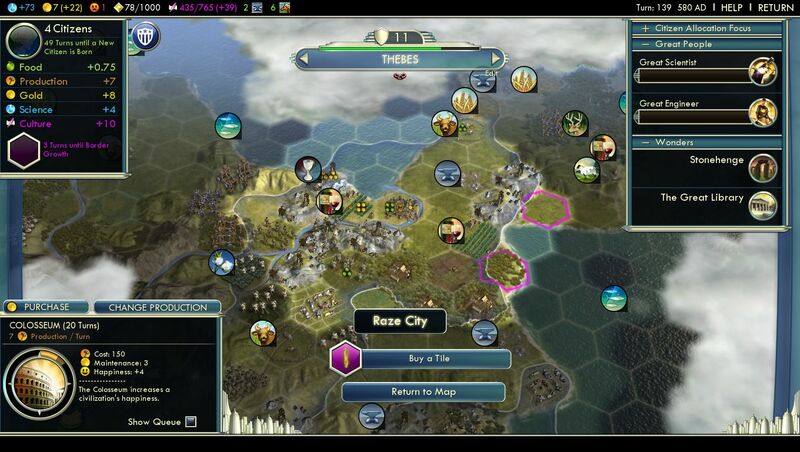 It's also completely impossible to tell what technologies the other civs have, which would be helpful to know! Even if the game wouldn't give you an exact list of techs, there should be some way to see if you are "backwards" or "advanced" vis a vis the other civs. 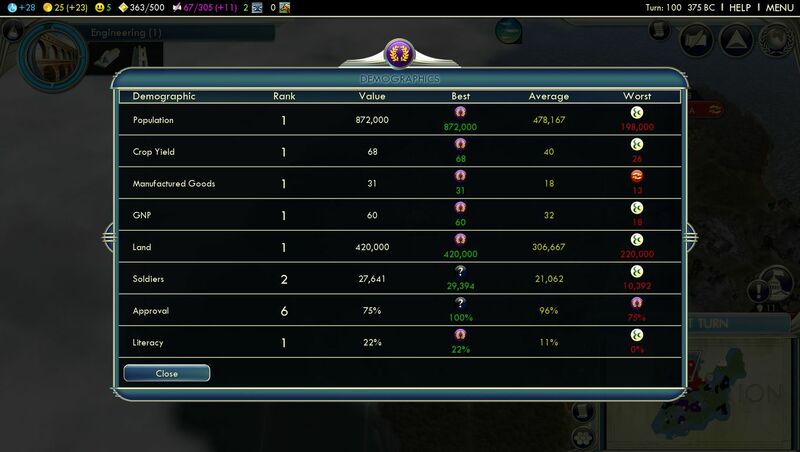 The one and only ranking you get with other civs right now is "score", which doesn't tell very much. 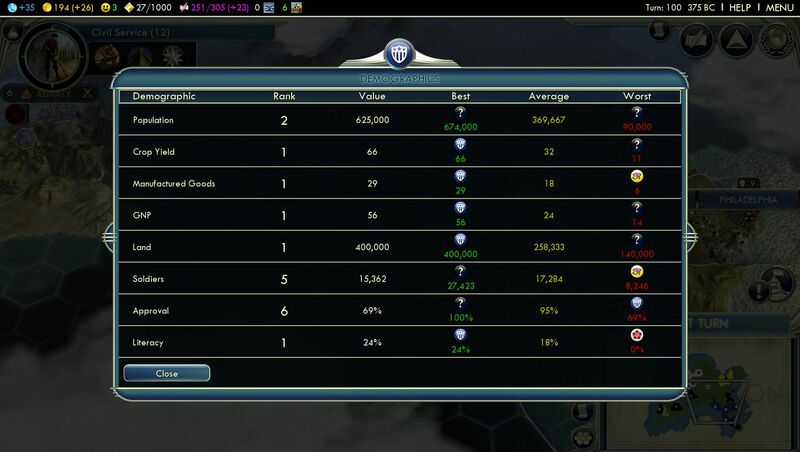 I miss the bar graph charts from Civ4 very badly. Firaxis, give us more feedback on how we're doing! I trained two catapults, and together they were able to destroy the defenses at Sidon very easily. No units lost, of course. It's pretty much what I expected in terms of combat, with the siege units slow moving and having to set up before firing, but with correct positioning they just annihilate everything the AI can do. Never attack cities without siege engines; catapults/trebuchets/cannons will take down the cities very easily. You'll take very heavy losses if you don't use them though. The AI doesn't appear to understand this yet, which is one reason why it's so easy to beat on the battlefield. Not too terribly bad. I was expecting worse, to be honest. Of course it's not great either, as the AI farmed non-river grassland tiles (while ignoring the river ones!) and lubermilled a bunch of forest tiles. There are also far more hills mined than the city has food to work. The AI does not understand that it should be farming hillside river tiles, which produce the best base tiles in the game. You pretty much want to farm everything next to a river regardless, since the Civil Service farms are so incredibly powerful. You pretty much get the Biology food bonus from Civ4 at the very start of the medieval age. Uhh, not sure if that's a good idea, but it's there, so exploit it! These four units, two catapults along with a Medic warrior and a swordsman, plus a Great General for support. Yep, attacking the Japanese empire with this paltry little force! Now I knew that this was far too few units, and this was some risky business, but I wanted to see just how far I could push things. The AI's military performance had been so, so poor in this game and my previous one. To be honest, I kind of wanted the AI to beat me, because an attack like this did not deserve to succeed. No further support, no road to the front lines, no cities building reinforcements to come in later - just these four units working together. The catapults performed fully as well as I expected, setting up on the two desert tiles above and then chewing threw the nearby Japanese units. I was helped here by the fact that some of the Japanese military was still off to the north from Nobunaga's campaign against Hanoi. Nevertheless, I was able to capture Kagoshima without loss, once again playing the AI for a fool and killing another four or five units. I wanted Kagoshima for its pearls, only to find that the AI had never connected them with a fishing boat! Heh. Well, I would send one up from Thebes eventually. 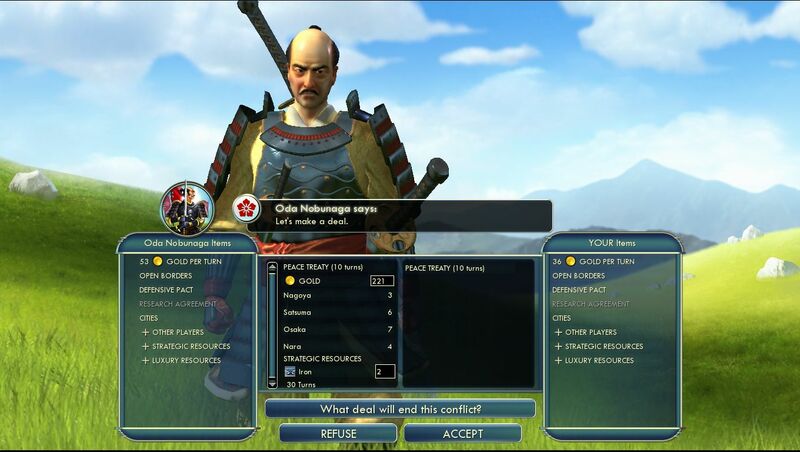 I tried to get peace at this point, but Nobunaga wasn't interested in talking. He wanted me to give him all my luxuries for peace, which was a non-option. I was not concerned... at least until the samurai started showing up! Tough units there, although I had to go into the Civilopedia to see their unique features. (Mousing over units does not display their abilities in this game. Would be nice if it did that.) Now I did start sending some more units up to the battlefront, and began a long road up from the former Egyptian territory. I also made use of unit upgrades for the first time, turning my warrior into another swordsman and my catapults into trebuchets. Upgrades are another gray issue of game balance right now, as it's actually cheaper to build early units and upgrade them than it is to build newer units! Plus, units keep all of their promotions and unique abilities on upgrade, and there's no loss of experience on promotion either. Upgrading units is currently very, very powerful - it should probably be more expensive to do so, or units lose some of their experience, or something. Ummm... really? Is that right? He offered me all of his gold, his remaining iron supply, and *FOUR* of his cities! Don't get me wrong, I had been winning the war and killed something like eight units for one loss of my own. But that can't possibly be right. He was just signing over more than half of his empire to me! Note that this was after the mini-patch that supposedly address this issue. Looks like the fix wasn't enough, because the AI was still willing to give up far too much in peace deals. Wow, look at that unhappiness! Up to minus 48, meaning my empire was severely unhappy. Have to deal with that in a second. First, this is the screen that immediately popped up after signing peace. What do I want to do with Nagoya? Well, maybe if I could see the city...? There was no way to look at the city in question, or even move the screen at all, which was locked in place on this prompt. I honestly had no idea where Nagoya was located, and the game was forcing me to make an important decision right now, without any chance to even see where the city was situated! Furthermore, if you choose to raze or annex the city from this menu screen, you cannot then change your mind and turn the city into a puppet. Uhh, this is not good interface design here. I don't really understand how this could slip through testing without being caught. A simple "zoom to city" option would fix this completely. Hopefully coming soon in a patch? As soon as the cities were gone, the situation solved itself. That means it's pretty easy to go conquering in this game, as long as you're willing to raze the cities rather than keeping them. Just save the capitals (because you can't raze them... ugh... less said about that game mechanic the better) and those cities which control luxuries you don't already have. Burn all the rest and you should be fine. I wanted to seal off Japan and take control of that region to the south, so I built a settler and sent it down to the fish/silver/cotton region. Why not just save the Japanese city located there? Well, aside from the fact that I had no idea which one was there, I wanted to move the location onto the coast, where I could take advantage of the social policy from the Commerce tree ("Merchant Navy") which grants +3 production to all coastal cities. Almost all of my cities were coastal, so I had prioritized that one. My sense of the Commerce tree is that it's really strong on Archipelago maps, much less so in other situations. I probably could have found more powerful options here, but oh well. Experimentation is part of the game. I was expecting him to ask this question, and expecting him to declare war, although perhaps I should have had my units one tile off of the border and triggered the declaration myself. Because he was able to move first, Nobunaga killed one of my swordsmen, on the tile south of Osaka where you see the Japanese horseman. The only one of my three swordsmen that I hadn't upgraded to a longsword, argh! Anyway, my catapults/trebuchets were untouched, and they were in pretty good position to fight, only the one treb up in the north out of range. In the following exchange, I killed all six Japanese units (two samurai, two horsemen, and two archers) at the cost of one longswordsman. Advantage, America. Advancing on Kyoto. 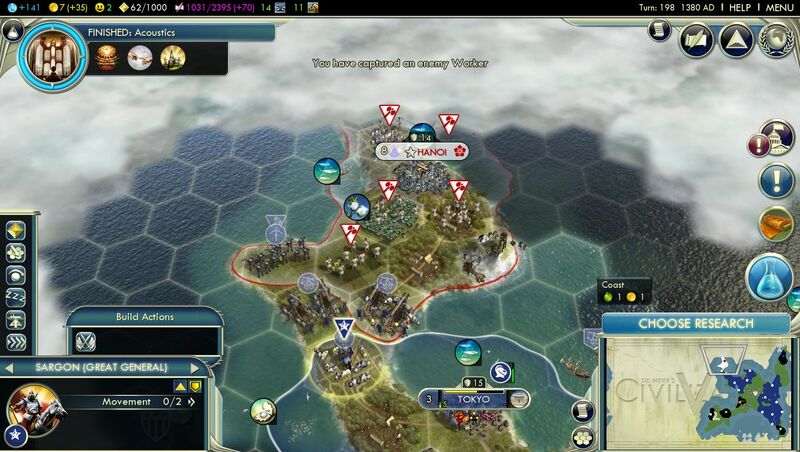 Once I killed those initial units that came pouring out of Japan, the civilization had nothing left, and it was a formality to march on and capture each city. 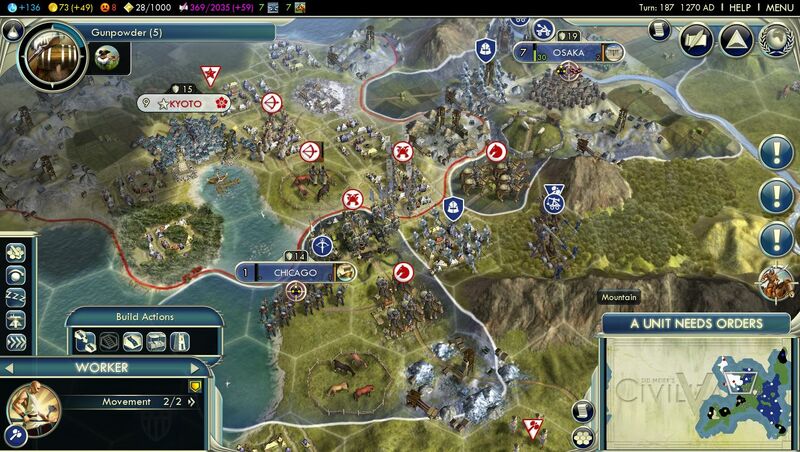 Very easy stuff, far easier than I remember warfare ever being in Civ4. Of course, this is for the same reasons that Sirian has pointed out, the greater complexity of the new tile stacking rules. What can the AI do here? They can't reach my trebs, the units that are going to be killing their cities. Even that catapult at the top is safe, because of the zone of control rules (can't move past the longswordsman's zone of control). The Japanese swordsman just sat in the city to help increase its defensive strength, which wasn't a terrible idea, although of course it did nothing. From here on out, I would walk through the remaining Japanese cities with zero resistance. Note also the chokepoints created by the narrow terrain here. More units on my part wouldn't do much of anything, because only about 6-8 units can get close enough to be part of the fighting. Civ5 favors small numbers of highly promoted units, and with how cheap upgrades are at the moment, you can use the same small collection of units for the whole game. Perhaps things are different on larger maps, I don't know. I barely built any units at all in this game though. The same ones, upgraded for each era, worked pretty well. Six Japanese workers all bunched up around Hanoi, and that's not even counting the three other workers I've already taken in this war. 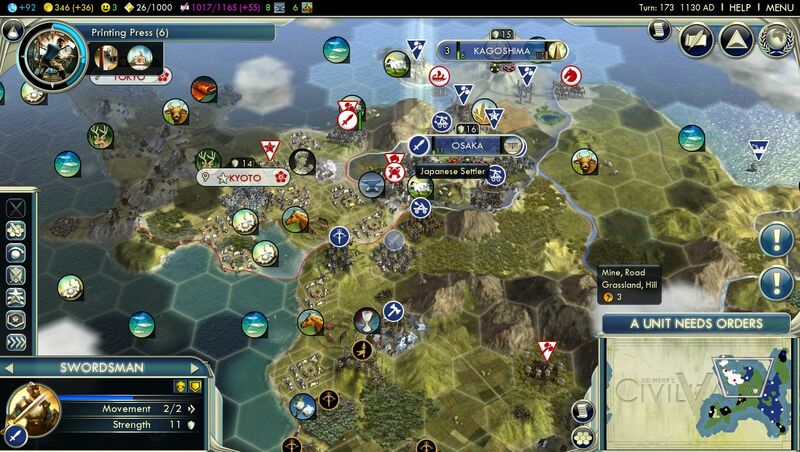 There's really nothing to do with these workers in Civ5; I just deleted them all on capture. In past games you could always build roads/railroads with excess workers, but of course you can't do that in this game, since every road costs money. I understand the thinking behind the design decision, but I miss those roads. 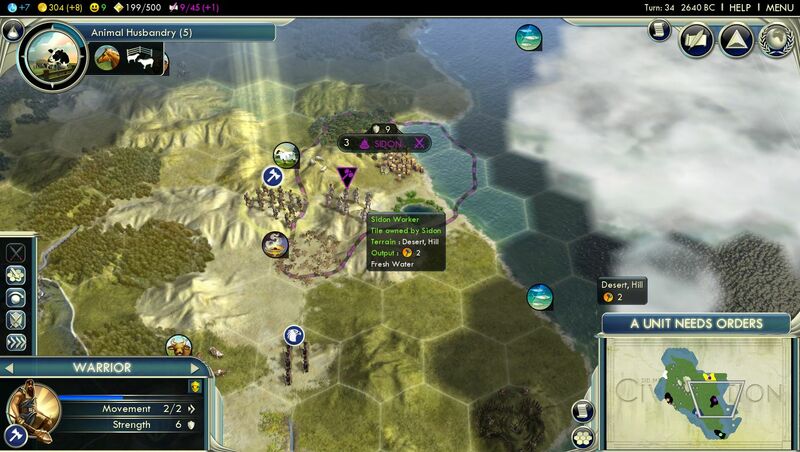 Having a strong road network is one of the basics of Multiplayer, and that's pretty much eliminated in Civ5. Can't afford to build more than one road between cities. I wish there were another way of reigning in having too much gold. Eight techs out in front of the pack, a full half-era ahead. I wonder why the AIs were so bunched up like that - you'd think there would be at least a little more variation. And again, just being able to access this information (how many techs each civ has) would be nice to know at all times, not just when a ranking list happens to pop up. The first exploration unit that can traverse the oceans are caravels, same as in previous games. Well, due to a combination of circumstances, I had some superpowered caravels! Caravels have a natural +2 sight as their default ability. Playing as the Americans, I had another +1 sight. I had earlier taken the Naval Tradition social policy, simply taking en route to that 3 production bonus in coastal cities, which granted another +1 sight and +1 movement. Finally, I captured the Great Lighthouse from Japan, which grants - you guessed it! - another +1 movement and +1 sight. Thus the total result was these awesome caravels with 8 movement able to see stuff 6 tiles away! It wouldn't take long to reveal the rest of the map with these units. I would soon find that the other continent contained China, Russia, and Songhai; China was the weak power, and the other two civs were competing for top tier status. In the last 130 turns, Washington has grown from size 8 to size 13. Once your cities hit size 10 in this game, they pretty much stop growing altogether. I'm not sure how I feel about that... Seems like a waste that cities can now work up to 37 tiles, and they'll never get much past half of that. I personally would like to see how the game played without maritime food, but with a smaller food box that filled up more like the one in Civ3/Civ4. I have no idea how that would work, just my gut feeling there. I'm so far ahead, I didn't feel like I could learn anything else from this game. I've got factories now, and enough coal to build them wherever I want, plus the awesome Order social policies unlocking (slowly!) meaning that this game is finished. Unlike some other games, I didn't find the endgame mop-up compelling enough to keep playing. What's strange is that the game balance actually feels better in the mid to lategame than it does in the early game, precisely backwards from Civ3 and Civ4! It's not until later on that you can finally start building stuff in a reasonable time frame, and maritime food becomes much less powerful later in the game. There's also some very interesting buildings that start appearing in the renaissance, stuff like seaports and universities and observatories, and you can actually build them in less than 30 turns because there's finally some production bonuses coming into play. I almost want to start the game at the halfway point on the tech tree, because the early game is so tediously slow. I can't imagine wanting to play on Epic speed at the moment. 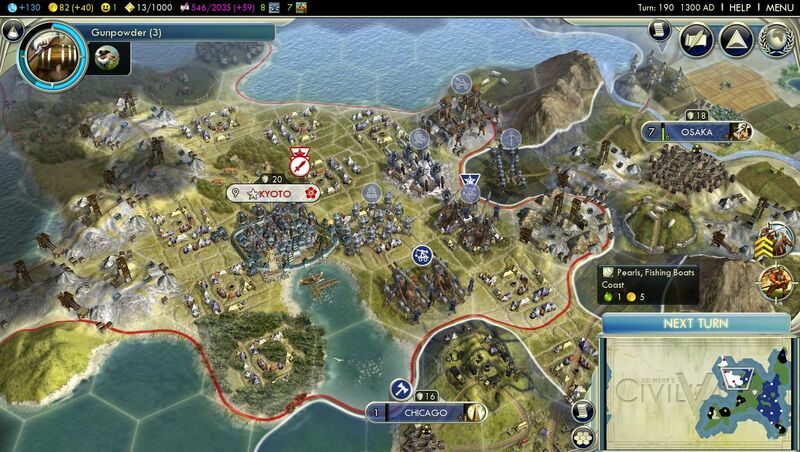 Overall, the release of Civ5 reminds me of the release of Civ3. It's a game with serious balance issues, and gameplay holes all over the place. Multiplayer is completely non-functional right now, unplayably full of bugs and crashes. I've been very harsh on Civ5 since it's come out, probably because I'm so disappointed that the game would be released in such a flawed state. Is this a good game right now? Sort of. It's not terrible, but it's very, VERY rough around the edges at present. Will it become a good game in time? Maybe. Hopefully. That depends on what Firaxis chooses to do. After the various fiascos associated with Civ3's release, I didn't think we'd have to go through this again. Apparently we will. Immortal difficulty is next; the game has yet to challenge me on the lower difficulties.